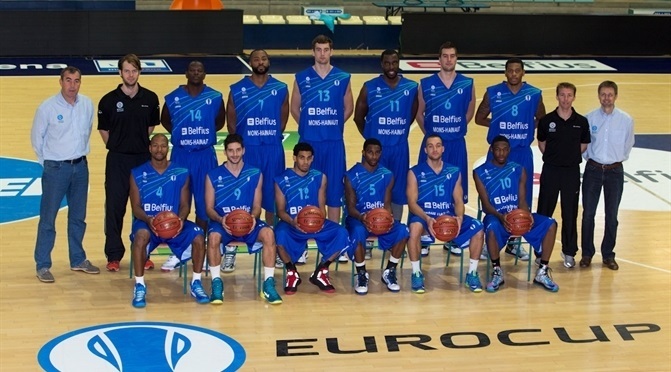 After a one-year hiatus, Belfius Mons-Hainaut is back to the Eurocup for its third appearance in the competition. Mons comes off a solid 2012-13 season and wants to keep its momentum going. The club went all the way to the Belgian League finals and reached the Belgian Cup semifinals, losing each team against Telenet Ostend, and had an early exit in the EuroChallenge despite a 3-3 regular season record. Founded in 1959, the team did not reach the Belgian fourth division until the early 1980s. By 1991, Mons - then called L'Union Saint-Joseph Quaregnon - made it to the Belgian second division and just one year after that it reached the Belgian elite. Mons has played in the first division since the 1993-94 season. Ron Davis helped the team take another step forward by reaching the Belgian League semifinals in 1997 and 1998. Mons became a regular team in European competitions and made it to the Korac Cup group stage four times between 1998 and 2002. In 2006 and with George Evans as its new franchise player, Mons won the Belgian Cup and reached the Belgian League finals, thus earning the right to play in the 2006-07 ULEB Cup. The team has been challenging for every title since and reached its first European competition final in 2008, though it lost against Barons/LMT 62-63 in the FIBA Eurocup title game. Mons returned to the Belgian League finals in 2009 before being swept by Spirou Basket. Last season, Mons reached the EuroChallenge Last 16, made it to the Belgian League semifinals and most importantly, lifted its second Belgian Cup trophy by downing Telenet BC Oostende 68-66 in the title game behind 16 points from Ronell Taylor. That allowed Mons to be back to the Eurocup in the 2011-12 season. Despite wins against Buducnost and PGE Turow, Mons did not survive the regular season. Mons went all the way to the Belgian League semifinals but Ostend swept their best-of-three playoffs series. Mons starts the 2013-14 season with great ambitions and high goals - be as competitive as possible in the Eurocup, fighting to get past the regular season, as well as lifting for that elusive first Belgian League crown. As always, expect a great basketball atmosphere at Mons Arena, with thousands of devoted fans trying to do their best to see Mons reach its goals.